With the V1 Kestrel, the goal was to modernize the VTail concept and make an enjoyable outdoor, big space, FPV airframe using miniquad electronics. VTails for many years had been DIY projects undertaken by a rare few, leading to certain design choices which limited the type of hardware which could be utilized. With the V1 we modernized the assembly approach to match current miniquads, opened the motor compatibility spectrum, and optimized the chassis for FPV. With the V2, the goal was the further refine and continue the styling heritage, but update the design further to improve strength, drop weight and provide more flexibility, making the Kestrel a more enjoyable flying machine Where the V1 used 6mm carbon, the V2 employs 4mm. Where the V1 used a significant amount of hardware, the V2 reduced that significantly. The total weight savings adding up to over 100g. Strength was improved by removing cutouts from the arms and tail section, improving rigidity and available surface area. Additional strength was added through the employment of the 'angel wings,' which connect the tail to the top plate of the assembly. This provides strength both in the event of tail strikes, but also improves the torsion of the tail, reducing any unwanted flex when using powerful motors. All in all, the V2 is a greatly improved product over the V1 and allows for a much freer and longer flying experience with all the yaw authority and fun of a VTail. X and H-Quads are boring. If there was a 'sedan' of the multi-rotor world, they would qualify. Horus wanted to bring something not only fast, but beautiful to the drone marketplace. 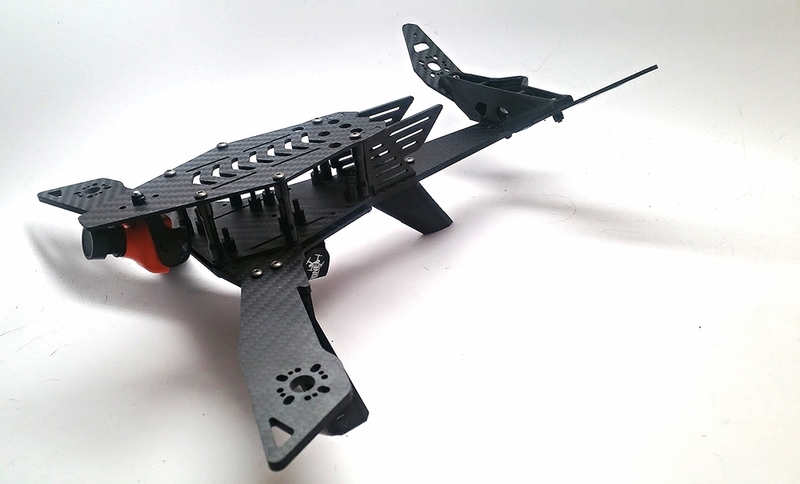 The Kestrel has the optional Aero Kit, designed in celebration of the IDRA 2015 California Cup. It slices through air, and introduces a degree of aerodynamic function and style never before seen on a VTail. Horus employs a unique blend of P.E.T. designed for engineering functional designs, rendering our parts stronger, more durable and functional than temperature sensitive PLA and flexible ABS. However, if you own a 3D printer, you can download replacement part files to create your own crash kits. We provide this to you for free because we don't believe in gouging our customers. Since crashing is the norm in FPV racing, we create a lot of waste from broken parts. Every single 3D printed part on the Kestrel is therefore recyclable, capable of being ground and reused at a later time. Not only is our material strong, but it helps us reduce the impact of our sport on the environment.